Born in England in 1938, Roger like most young English lads had a good childhood with lots of activity. His cycle influence began at home where his Dad rode bikes until an accident took the life of a close friend. At 14 years of age, Roger rode on a bicycle racing team. Yes, a group of lads raced pedal bikes on an oval track which entertained a full house every time. The bikes had only one pedal and were fitted with special tires and handle bars. The riders were equipped with team sweaters and thoroughly enjoyed themselves. His older brother had a motorcycle which Roger would borrow… this probably starting his career which he grew to love so much. He would start the bike by running along with it in the field, however, stopping was something done in a somewhat unusual manner. He would keep running the bike until the tank ran dry as he was too short to touch the ground. Roger then began collecting different bikes which he would ride through the many fields and when he started to work, travelled back and forth on a Frances-Barnett 197cc. 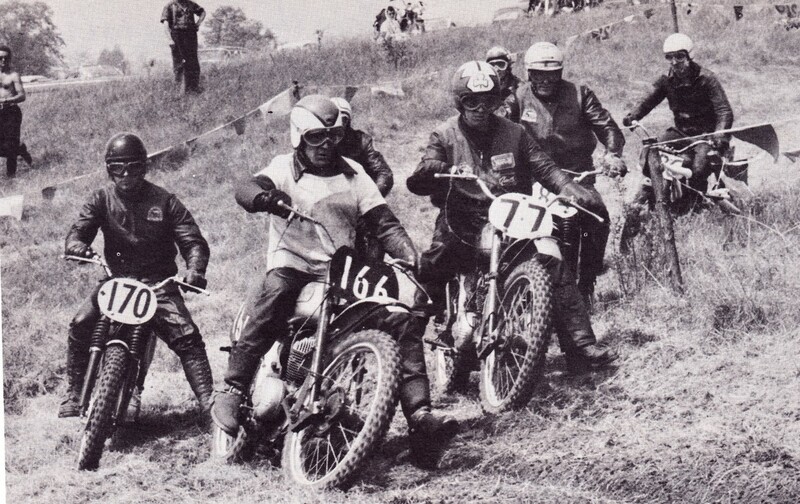 While still in England he rode trials and did some scrambling until moving to Canada in 1957. 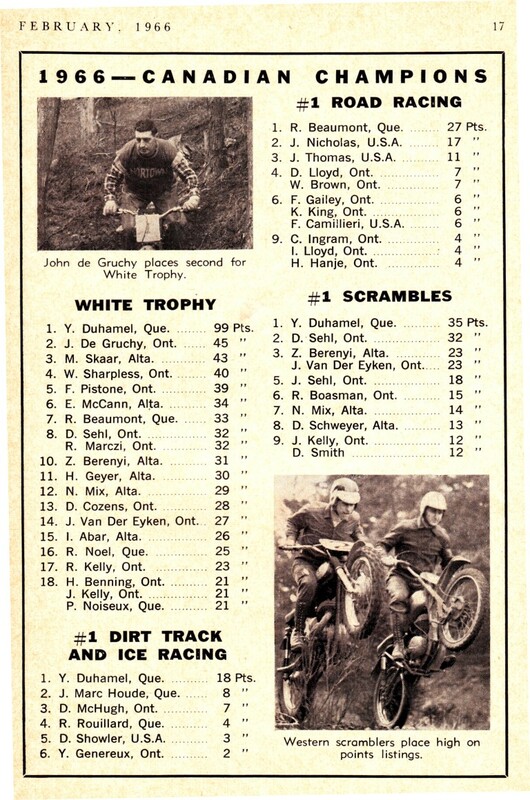 Roger was chosen to be on the first Canadian/US Challenge scramble team running at Grafton, Vermont and Copetown, Ontario and was chosen again the following year. 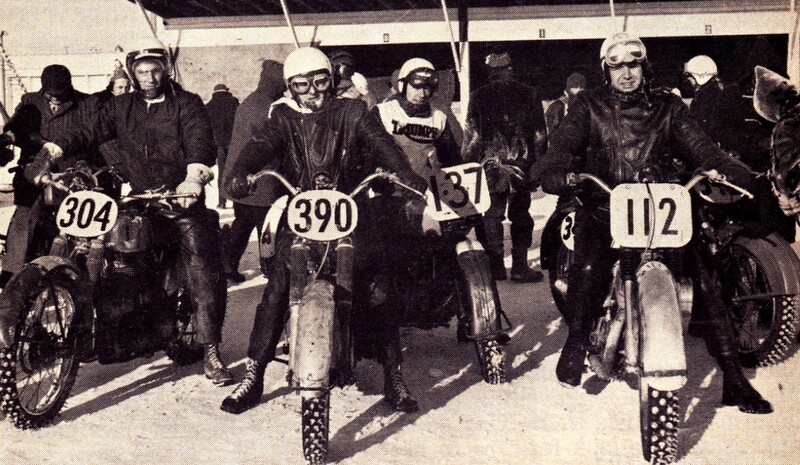 His real competition began in 1957 when he scrambled with an old Norton then, when winter arrived, ice-raced for the fun of it and that summer tried his hand at dirt tracking. 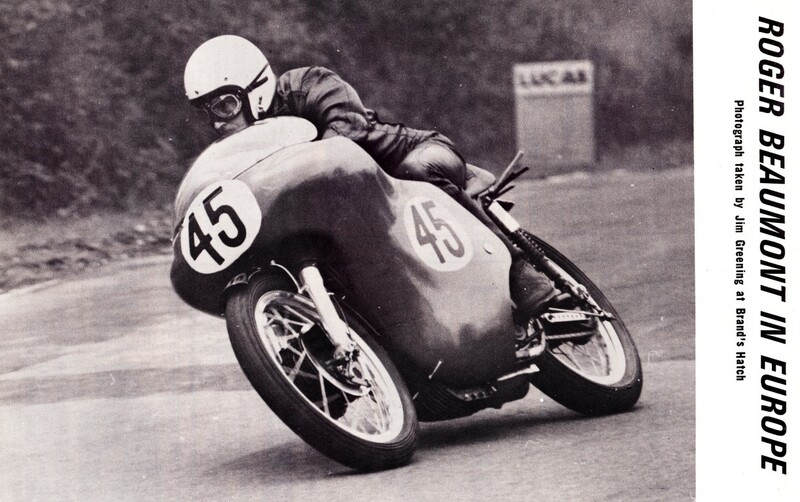 From Nortons, Roger went to a Velocette which he began road racing and found out that this was his favourite type of racing. 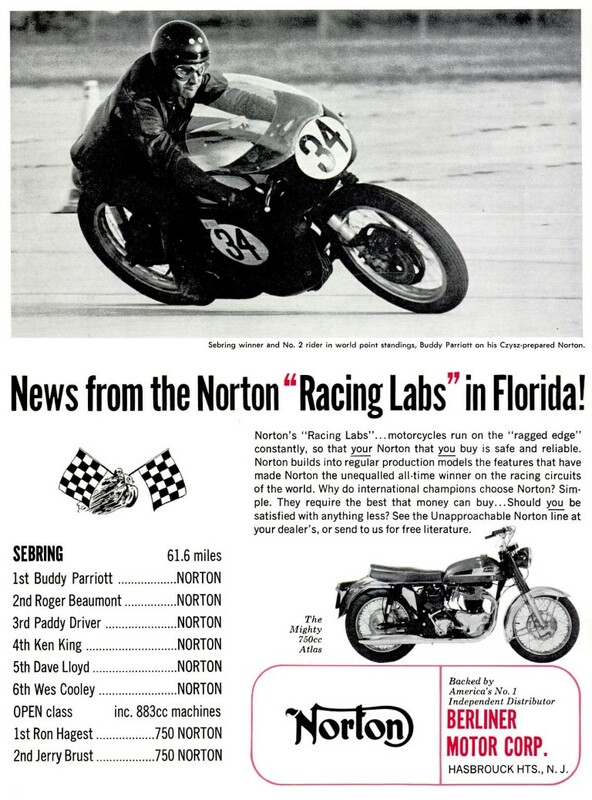 His Manx Norton bought in 1962 brought him many victories and in 1965 he won the National Championship Road Race (and the #1 Plate) and repeated the effort the following year on a Triumph Bonneville. In 1965 Roger placed 3rd (Hailwood was 1st) in the US Grand Prix at Daytona and won FIM World Points Championship, 500cc Class. 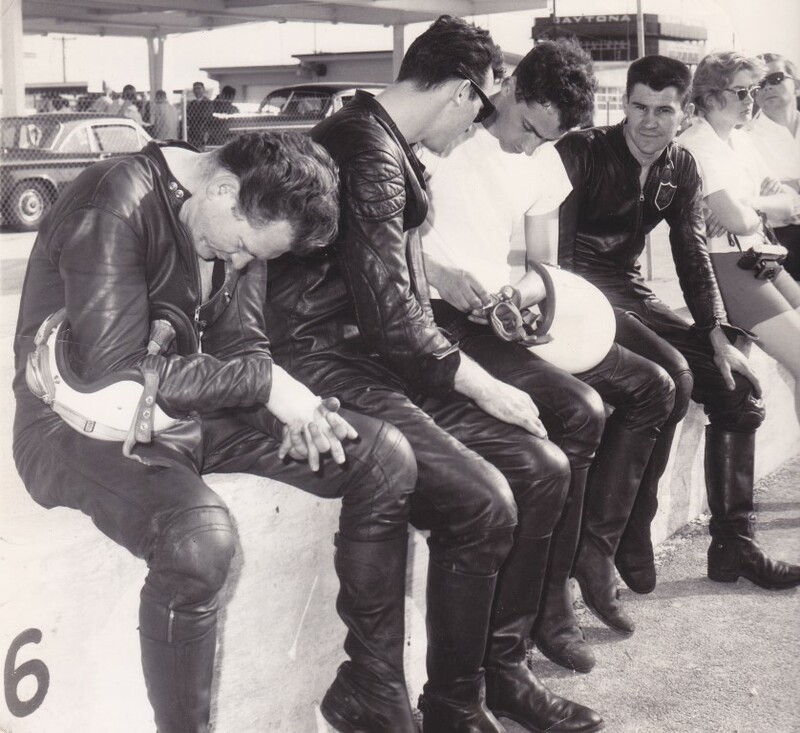 In 1966, he and a friend, Dave Lloyd another Manx rider, toured Europe where he learned many new things from the world’s best riders. Corners became just part of the race whereas before they were the most difficult part of the track. Roger’s best performance was at Hockenheim, Germany when he placed 8th overall and was the first private entry. Roger has had many Canadian victories which his 75 trophies prove but his most remembered race was in 1967 in the World Championship Grand Prix at Mosport where he diced with another well-known Canadian rider with European experience, Mike Duff. It was a short duel all the way and Roger said it was the fastest he had ever had to ride. Roger was a quiet, well mannered fellow married to a lovely girl and they had three children. He was a Quebec resident but moved to London, Ontario in 1968 and took a job with Raymond Burke Ltd., distributor for Triumph. Burke sponsored Roger with much success as he won almost every race he entered. In the Unlimited Class, he rode a Bonneville and used a stock machine for the Production Class. Over the years, Roger raced many circuits with many top quality machines. His biggest ambition was to ride the Isle of Man a few more times. He rode it for the first time in 1966 at an average speed of 92MPH and wanted to be among the few names who average over 100MPH. In 1970 Roger finished third overall in the running for the White Trophy with most of his points coming from road racing. In 1967, Bill Sharpless had a test-ride on the Triumph distributor’s factory TR100 but never felt confident with its clip-on bars. 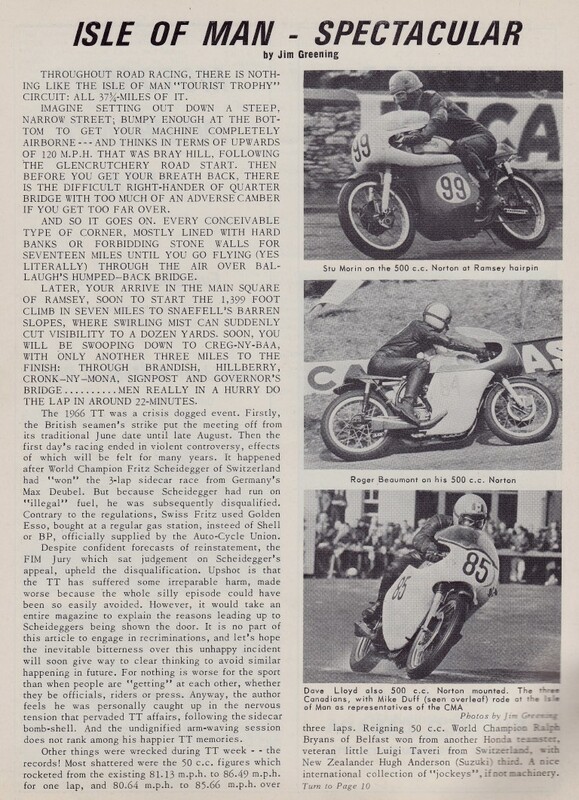 Roger tried it but didn’t like the handling either so he swapped the motor into his Manx frame and won several races. 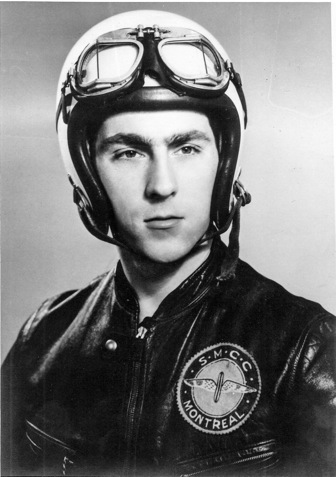 With the help of Ray Gref who made possible the status of the record attempt in 1968, Roger set an FIM/CMA land speed record of 167 MPH at Bagotville, Quebec riding a Burke Triumph – 650 Bonneville. Roger died suddenly of a heart attack on October 30, 1979. He was only 41. He accomplished much in a short period of time and we’ll never know what more he may have achieved. Roger was well known to road racers in Canada and his friend and competitor, John Davies, established the Vintage Road Racing Association Roger Beaumont Award in his memory. It is awarded annually to the individual who best exemplifies the spirit and intent of the sport and whose dedication and commitment have contributed to the VRRA club and vintage road racing. 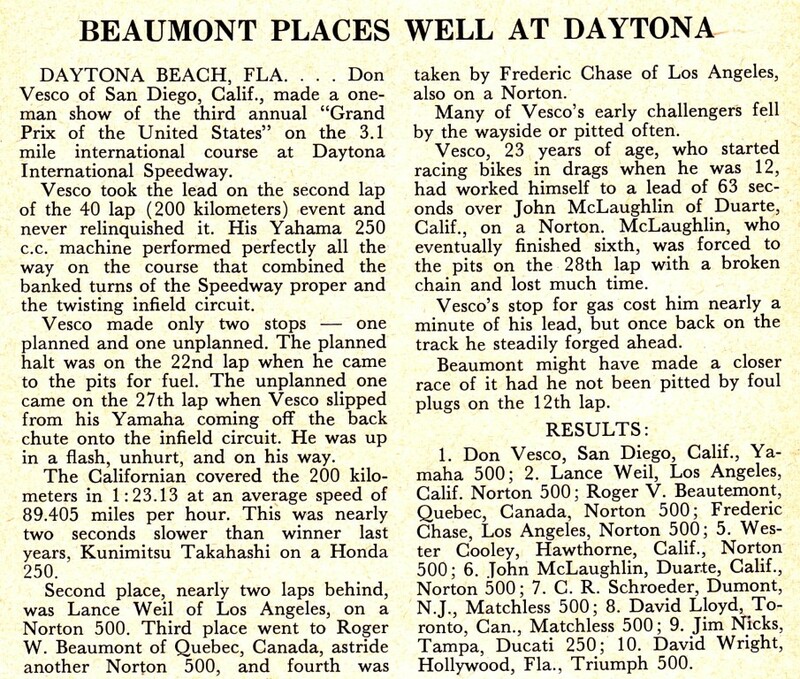 Roger Beaumont passed away in 1979.